Our Hawthorne Movers are here to take care of the heavy lifting for you on your move. Clean-cut student-athlete Meathead Movers are ready to get you safely settled into your new Hawthorne home. Our professionally trained student-athlete Hawthorne movers and our moving concierge service are here to help you with every stage of your move. If you are moving to or from anywhere in Hawthorne, we are the moving company for you! Surrounded by the 105, 110 and 405 freeways, Hawthorne is an ideal area for those looking to commute to other parts of the L.A. metropolitan area. The city was once famous for being the Northrup headquarters, and although most of the aerospace industry has moved out of California, there are still plenty of jobs in the area. There are several well-kept parks in Hawthorne, and the city is just a few minutes from the beach. Redondo Beach and the Redondo Pier are just a short drive away. These oceanfront attractions are family-friendly and not overcrowded. Since Hawthorne is so close to the ocean, residents enjoy mild weather all year. While many moving companies employ temporary workers who are often untrained and care more about their paycheck than about doing a good job, Meathead Movers employs respectable, clean-cut student-athletes who are training for successful futures. Our Hawthorne movers naturally strive for success, so customers can rest assured that these workers will do the job well and work quickly. When these strong young students are not moving items, they are jogging to stay in shape and save you valuable time and money on moving day. 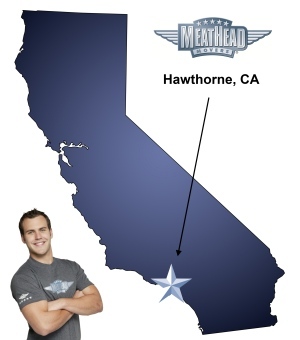 If you are considering a move, Meathead Movers is here to help! We are consistently rated the top moving company in California for long-distance, commercial, and local moves. If you need help packing away fragile items, Princess Packers can help you out! Princess Packers employs professionally trained students who will carefully pack away your fragile items to ensure they make it safely to your new home. We are also proud to offer long and short-term storage services. Additionally, if you’re in a jam and need a babysitter, a house cleaner, a landscaper, or any other service provider, our signature move concierge service can connect you any day of the week with several Meathead-approved businesses. Moving to Hawthorne should never be a hassle. With a 100% satisfaction guarantee, you have nothing to lose. Give us a call today to learn more about what the Meathead Difference really means. Our Hawthorne movers can even give you a no-obligation, no-cost move quote. Moving to Hawthorne? Here are some helpful resources. All of the young men were friendly, polite and worked extremely hard. They did not waste a second, all of them accounted for every minute which was very much appreciated. I would hire them back in a heart beat. Thank you for offering such a wonderful customer service base business, something that is getting harder and harder to find in this day and age. I would recommend them to all of my friends and family and anyone looking for movers. Jeremy was great. Other guy was very green and slowed down the whole process. Should not send someone that green with only one other person. Seemed unfair to Jeremy as well, he couldn't do his job to the best of his ability because he was having to pick up the slack for the other guy. They're professional, and energetic. I like supporting student athletes and rewarding people who working and earning. Meathead movers came recommended to me and you certainly didn't disappoint. I'll most likely use your services again in about a year when I move again.